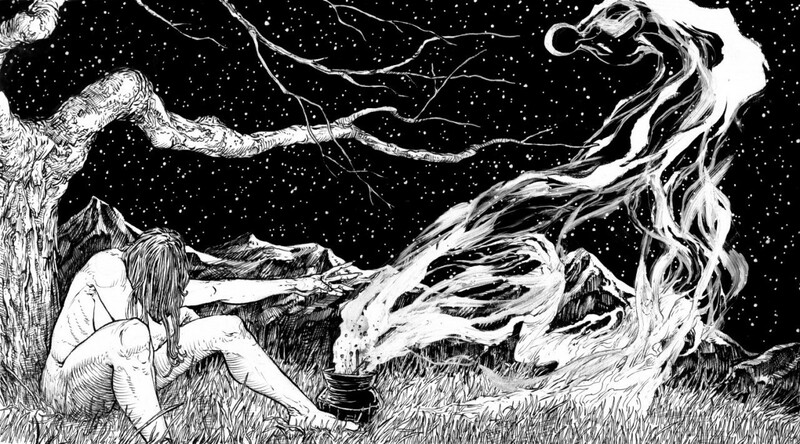 “Lay Your Woes Upon the Ground and Know That the End Will Soon Swallow You” begins the album on weighty, Neurosis-like tones but soon develops into something much more that the doomed sludge its initial steps are based on. Rachel from False lends her incredible voice to the latter stage and in her screams and black metal slanted style, darkness is led to the foreground and all hope is extinguished. “Wander, Part II” is a small interlude that incorporates softer passages within its droning landscapes yet the sly undercurrent of fear is ever present in the tentative steps of the guitars. It’s a much needed moment of quiet in an otherwise painful experience. “A Shell of One’s Former Self” closes out the album on a gorgeously melancholic atmosphere that includes Sarah Green’s mournful cello and her similarly sorrowful voice. Cavernlight bring many different influences to their music but anguish is the main focus. The band are willing to explore their pain and in this record their pain is shared with anyone who may be struggling with circumstances beyond their control. Adapting text for any medium is a struggle; some books are entirely untranslatable to another format, some are transferred and fail, some are mined for years for content and somehow lose their magic after a time. Some, are perfectly placed for a band to come along and reinterpret the text for the modern age, and for Switzerland’s Schammasch, that text is the surrealist writings of Comte de Lautréamont and the book Les Chants de Maldoror. Here, the Swiss band takes directly from the text and build a world around it with ambient movements, ecclesiastical elements and a grand sense of purpose. Coming so soon after a much lauded triple record may seem a little much, but should artists take their time for the benefit of others? It’s an interesting conversation perhaps saved for another time. “Prologue” builds the world in ambient layers and backwards speech and it’s in the touches of tribal drums and otherworldly rhetoric that Schammasch create a work that transcends the black metal brush they’ve been painted with. Guitar inflections are recognisably theirs; the opening chords of “The Weighty Burden of an Eternal Secret” is a motif used throughout their work but the music takes many turns on its journey towards the end. The transitions through spoken word, layered soundscapes and more traditional black metal elements are cohesive and where lesser bands could fail in melding those aspects together, Schammasch are methodical in their approach and each moment is executed with precision. “Along the Road That Leads to Bedlam” is all blasting drums and opposing voices – male and female representing the symbiotic relationship at the core of the work – and is electric in its progression. “May His Illusion Last Until Dawn’s Awakening” changes approach and after a moment of spoken word, a deep, rich vocal rings out that embraces the gothic elements of the Schammasch sound – a tactic used to great effect on Triangle last year. The song is almost the most black metal of the EP but it’s “Chimerical Hope” that earns that place with a furious pace that brings back more traditional instrumentation and frontman C.S.R.’s powerful screams, along with his (somewhat more interesting) clean vocals. The Maldoror Chants: Hermaphrodite is a great experiment for this band and the first in a proposed standalone catalogue that will run alongside their main body of work. It’s a leap forward from the third part of Triangle – The Supernal Clear Light of the Void where a lot of the foundations of this release are built from, but it seems like a natural evolution and one that will carve Schammasch a place in the modern black metal world as a band unafraid of progress. *Disclaimer: I do have a personal relationship with this band so before this fact is pointed out please understand that in no way did that colour my opinion. Rest assured, I am entirely honest about a release, whether I know the artist or not (which happens in a myriad of cases the writing world over) and no-one pays to be featured here (OH SNAP). I’m more than aware that it’s a dubious case but no-one reads this thing anyway. Japan’s Vampillia and America’s The Body are two bands at the forefront of experimental music, so for the two to collaborate on a release makes perfect sense. They both bring a sense of unease to proceedings and both incorporate completely off-kilter rhythms and electronic beats in their frenetic pursuit of the unknown. “Cold Bark Bite” begins on static and pulsing beats but soon segues into violin, synthesised voices and Chip King’s overwrought screams, before completely pulling back and entering an even weirder lounge-like realm. It’s a terrifying melding of the two worlds and a track that burrows into the subconscious, still pounding in your head long after the record is over. “Chikatilo” starts off on calm textures yet the subdued nature of the track doesn’t last long and soon industrialised rhythms are ramping up the terror, layering mechanised beats over furious screams and horrifically cloying atmospheres. xoroAHbin is truly terrifying at times, Vampillia and The Body bringing the very extreme portions of their sounds together to create a fascinating work that is hard to turn away from. It’s not new music, having been released on a limited CD during a joint tour a few years ago, but it shows that Vampillia and The Body are ahead of even themselves at times.